Lung fibrosis or pulmonary fibrosis is a disease of the lungs where the tissues of the lungs become scarred and damaged. This damaged tissue makes it difficult for the lungs to function properly. The worsening or severity of the disease makes the affected individual more short of breath. The increase in damage of the lungs worsens the condition of the affected individual and very sadly this damage so caused to the lungs is irreversible. Proper and timely treatment reduces the progression of the disease and improves the quality of life. In the worst cases, a lung transplant is the only solution that remains. The signs and symptoms of lung fibrosis should be closely observed so as to administer proper medicines as well as treatment procedures which helps in the progression of the disease any further. Some of the important symptoms of the disease are as follows. The symptoms and its severity vary from person to person as per the severity of the disease. Lung fibrosis thickens and scars the tissue present around the alveoli of the lungs which makes the passing of oxygen into the blood difficult. Some of the notable causes of Lung fibrosis are as listed below. Environmental factors or occupational hazards can cause lung fibrosis. Long term and constant exposure to different pollutants as well as toxins such as asbestos fibers, coal dust, grain dust, hard metal dust, silica dust etc. can cause lung fibrosis. Radiation therapy or treatments for breast or lung cancer can cause damage to the lungs. The degree of damage depends on the total amount of exposure to radiation and the portion of lungs that underwent the radiation treatment. The lung damage can be even more if chemotherapy was also used and the disease of the lungs for which the treatment was used. There are a number of drugs when used can cause lung fibrosis such as some heart medications like amiodarone might harm the tissues of the lungs. Use of some antibiotics like nitrofurantoin or ethambutol and some anti-inflammatory drugs like rituximab or sulfasalazine can cause damage to the lungs. There are some medical conditions or diseases such as scleroderma, rheumatoid arthritis, pneumonia, systemic lupus erythematosus, mixed connective tissue disease, dermatomyositis, sarcoidosis, and polymyositis can give rise to lung fibrosis. 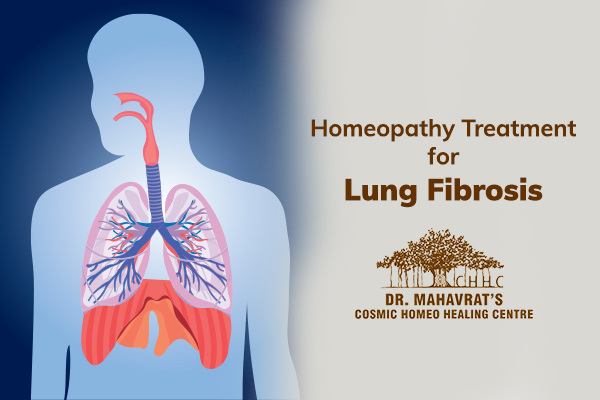 Homeopathic treatment for lung fibrosis is aimed at preventing further damage to the lung tissue. A number of homeopathic medicines are used on the affected individuals so as to improve their quality of life. The most common medicines used in this regard are beryllium and silica which have proved to be very effective in the treatment of the damaged lung tissues. The treatment depends on the extent of damage of lung tissue and the underlying cause of the damage. In many of the cases, Arsenicum jodatum, calcium carbonicum, lycopodium and Teucrium scorodonia are the homeopathic medicines used for the treatment of lung fibrosis.